Armenia is not in vain called a land of sun. The number of sunny days per year reaches to 250 days in the Ararat valley. On average, the amount of sunshine duration is up to 58%, and in a warm period the duration of sunshine is annually 82-87%. This is because it is located in the subtropical zone. 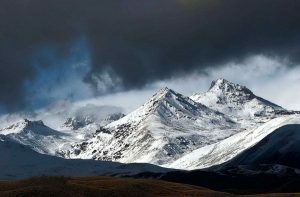 It is also known that Armenia is a mountainous country. Therefore, in its territory there is not only a subtropical climate, but also a continental and a temperate. In Yerevan and throughout the Ararat valley, the climate is dry continental with hot summers, moderately cold winters with little snow. In the lowlands, near the north and east of the Ararat valley, the climate is moderately dry, with warm summers and moderately cold winters. In the midlands of the central part of the country, at altitudes of 1500–1800 m, the climate is temperate, with warm summers and cold winters. In the northeast of the country (Tavush) and the southeast of Meghri at altitudes less than 1000m, the climate is dry subtropical. Here summer is long and hot and winter is mild, with little snow or snowless. At altitudes of 1800-3000 m, the climate is moderately cold, humid, and the average annual rainfall is 800-900 mm. It means that in Armenia there is an amazing and charming landscape in every corner. In winter there is also a good opportunity for active holiday lovers to have a great time in Armenia. 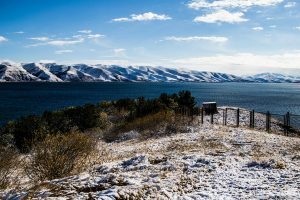 Lake Sevan (Gegharkunik, 60 km from Yerevan) invites you not only in summer, but also welcomes its visitors in winter months. Here is a newly built ski complex. It is very convenient for beginners. The hotels, recreational areas and hostels, located on the coast, attract more and more tourists. Here you can try amazing Sevan trout, go on excursions to the church Sevanavank (VIII century) and in the monastery complex Ayrivank (IX century). More experienced and professional skiers can go to Tsakhkadzor (Kotayk region, 50 km from Yerevan). During the Soviet period a tourist base, a sports base for athletes of various kinds of sports, and many rest houses were located here. 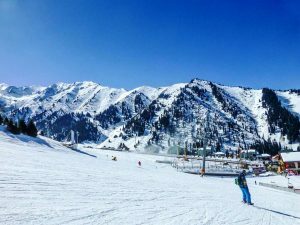 Now this resort city has been inviting winter sports enthusiasts to take a ride on the slopes of Mount Teghenis. Here are the tracks recently reconstructed and new ones are laid. Their total length reaches 30 km. The longest of them is 8 km. They are of varying degrees of complexity. You can just ride on a regular track of three kilometers. Professionals will appreciate the route with steep descent and turns, which begins at an altitude of 1.8 km above sea level. You can reach to the place of the start of all the tracks with the help of the new Austrian lifts. If necessary, instructors of ski school will help you. Here you can also go down on snowboards, there is a platform for skating. It is possible to ride on a snowmobile. And at the end you can relax and spend the night in one of the many hotels with comfortable rooms. 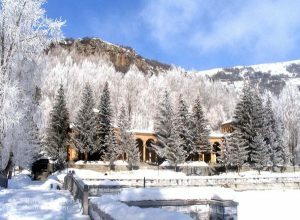 Another resort town of Jermuk (Vayots Dzor region, 173 km from Yerevan) also invites you to its ski slopes in winter. They were built on Mount Shish recently, in 2007, and their popularity is gradually growing. These tracks are at an altitude of 2100 meters, and their total length reaches 2.6 km. They are more suitable for quiet skiing. On site you can rent the necessary equipment. It is planned to lay new tracks here, equip with lifts and develop the infrastructure. But Jermuk is better known for its healing mineral waters. Local balneological clinics have been popular for 70 years. They are located among alpine meadows, Syunik ridges and forests. In the city itself, the famous table mineral water “Jermuk” is produced. The city also has many cozy hotels, a beautiful public garden, the Drinking Gallery is a beautiful architectural structure, with drinking water taps coming out of its walls. From each tap comes a certain type of water. By the way, in each tap you can find water of different temperatures. It is also interesting to visit the Arvi gorge, on the ledge of which is the monastery of Noravank (XIII century). These conditions contribute to the fact that a number of tourists every year come to Jermuk. You can spend more active and diverse time in Yenokavan (Tavush region.145 km from Yerevan). Here are at your disposal several cozy two-stored cottages and houses with a fascinating view from the windows. Nearby in the forest are laid special trails for hiking. Here is a stable and a horse riding can be organized. 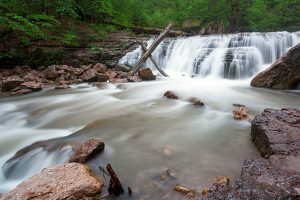 Excursions to the waterfall, hiking in the mountains are also offered. Fishing lovers will also be able to enjoy their favorite entertainment, as a pond system can be found here. It is possible to ride mountain bikes that are rented on site. Extreme lovers can test themselves in the “Yell Extreme” amusement park: ropes, giant swings, jumping, archery… And, of course, the most exciting thing is to ride a zip-line at an altitude of 200-300 m at a speed of 120 km / h. This is the longest zip-line in the world with a length of 2680 m.
Impressions will be enriched with the 3-kilometer excursion through fascinating places to Lastiver caves, where people lived in the middle ages. It is probably already clear that excellent rest, positive emotions and wonderful memories are provided in Armenia. You can visit Armenia at any season you want.